This paper surveys the development of cost accounting and managerial control practices and assesses their relevance to the changing nature of industrial competition in the 1980s. The paper starts with a review of cost accounting developments from 1850 through 1915, including the demands imposed by the origin of the railroad and steel enterprises and the subsequent activity from the scientific management movement. The DuPont Corporation (1903) and the reorganization of General Motors (1920) provided the opportunity for major innovations in the management control of decentralized operations, including the ROI criterion for evaluation of performance and formal budgeting and incentive plans. More recent developments have included discounted cash flow analysis and the application of management science and multiperson decision theory models. 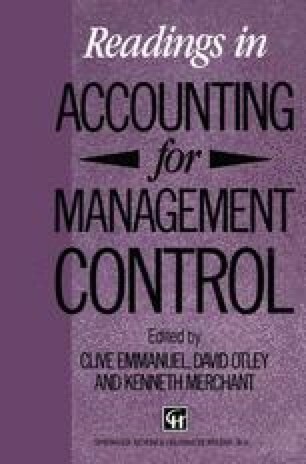 The cost accounting and management control procedures developed more than 60 years ago for the mass production of standard products with high direct labor content may no longer be appropriate for the planning and control decisions of contemporary organizations. Also, problems with using profits as the prime criterion for motivating and evaluating short-term performance are becoming apparent. This paper advocates a return to field-based research to discover the innovative practices being introduced by organizations successfully adapting to the new organization and technology of manufacturing.